I’m not a fan of horror. In recent decades, the “gorenography” surrounding the genre seemed to appeal to the lowest common denominator. Jump scares and excessive on-screen violence were the norms. It seems that films like Get Out (2017) have changed that, judging by how expertly A Quiet Place (2018) still holds to some of the horror tropes but tells a story that’s much more thrilling than seeing a group of people gored to death one-by-one. In the end, A Quiet Place is expert storytelling at its finest, based partly on how adeptly it uses the medium of film to convey its horror. While there seemed to be a few minor plot holes and curious decisions on the part of the characters, I’m just going to chalk them up to “horror logic” and move on to why I think this film is required viewing, even for people who hate horror movies. What strikes me so much about this film is the raw terror of the characters, which is then passed off onto the audience in a way that dialogue, narration, or reading can’t accomplish. When we take away one of the fundamental things that make us all human—our ability to make noise—then suppressing that natural ability in order to survive ratchets up the tension to epic proportions. A Quiet Place uses all the tricks in the filmmakers’ toolkit, especially since it goes in with limited audio and full visuals. Great moments of foreshadowing are only surpassed by the cringe-inducing moments when someone screws up and makes a noise. The amount of thought that went into creating a world where making noise could get you killed is in prime form here and is included in even the most subtle details throughout. Sure, there are scary moments in this movie, but the ending is so incredibly satisfying that these moments are completely worth it. 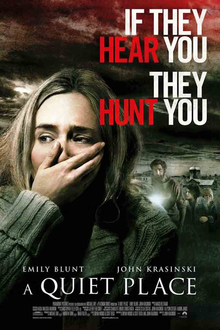 A prime example of expert storytelling, I give A Quiet Place 4.5 stars out of 5.